What comes with the Exocet kit? 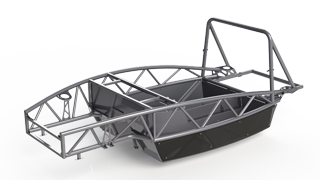 The Exocet chassis has been completely reengineered for improved rigidity, safety and minimized build time. Every single tube and panel has been redesigned using the latest CAD software and extensive Finite Element Analysis (FEA) to eliminate weak points, improve stiffness and optimize weight. New front and rear bulkhead designs, stressed driveshaft cover, gusset plates, triangulation tubes, integral rollbar design, revised tubing wall thicknesses, a boxed-in engine bay, and a revised floor that now functions as a loadpath between the subframes and suspension points all contribute to an over 300% torsional stiffness improvement compared to the previous model. 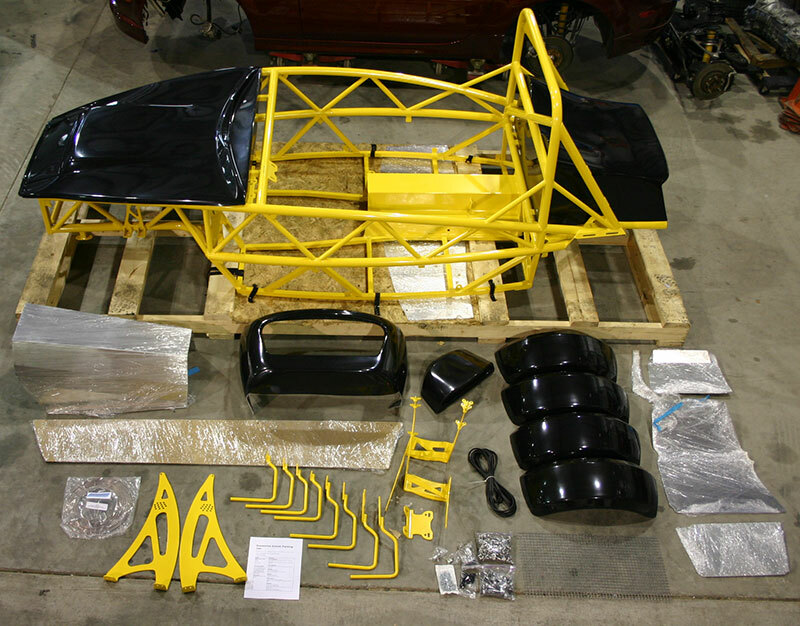 Each Exocet includes hand laid composite body panels available in 188 gelcoat colors. Our panels do not require paint and provide a high gloss finish. The Exocet fiberglass body panel set includes the Nose/Hood, Rear Tank Cover, and Gauge Cowl. Fenders are available as an option. All Exocets include laser-cut Aluminum floors, transmission cover, and bulkhead components. For the easy installation, each panel is pre-bent and complete with pilot holes. The floors even include drainage holes in case you get caught out in the rain. The complete set includes three front bulkhead panels, two rear bulkhead panels, two floors and one transmission cover. An optional wiring tray to help hide the wiring harness is also available. The included smoked Plexiglass/Acrylic side panels give the driver and passenger a view of the passing roadway while highlighting the exoskeletal chassis to viewers. The panels include all mounting holes, grommets, and stainless steel mounting hardware to attach the panel to the Exocet chassis. Using acrylic also provides an easy surface to add graphics/vinyl. Your kit comes with a comprehensive hardware pack to use during assembly of the Exocet. We include high strength Class 10.9 metric bolts, nuts and washers to mate the Exocet chassis to your Miata subframes. Individually bagged rivets, self-tapping screws, P-clips, Cunifer Alloy brake pipe, flare nuts, vinyl edge trim, NA radiator mounts, and bodywork mounts are also provided so you can spend more time building and less time sourcing parts. Our interactive build guide and support community provides a quick path to the answers you need. Enjoy the convenience of a comprehensive build guide, Miata knowledge base, builder community, and support portal all in one easy-to-use place. Interact directly with Exomotive and our group of innovative builders who are excited to share experiences and help you along your way. It’s available 365/24/7 and you can access it through your computer, tablet, or smartphone. Sounds great. But what else do I need? The Exocet is designed to be mated to the drivetrain from a 1990-2005 Mazda Miata.